The public wants better roads and transit, a research facility, denser housing and lots of open space at the Point of the Mountain. A state panel agreed. Commission forwards public-endorsed plan to Legislature for more action. • interconnected and vibrant urban areas with a range of entertainment options — not a regional sports complex or arena. To anchor it all, they want a 700-acre “urban-style” retail and office center with nearby residences, along with a world-class university or research center presence on the site of the current state prison in Draper that will focus and supercharge economic growth. And they want all of it even with a potential public investment of roughly $12 billion. The commission created to draw up plans for the Point of the Mountain area between Sandy and Saratoga Springs, and Herriman to Lehi, agrees with the public. The commission voted unanimously Tuesday night to endorse a development outline that includes all of those components and forward that blueprint to the governor, Legislature and local communities for further action, including funding the next stage of work on the proposal: identifying funding possibilities and planning for possible implementation. A state lawmaker who is co-chairman of the commission said he was working on a bill to fund that next stage and a second bill that would create an independent authority to oversee how the former prison site is developed. The plan endorsed Tuesday is a hybrid of five options announced in November. Since then, the commission has gathered public input via workshops, an online survey and other public presentations. The public’s preferred plan is more or less a combination of the two most expensive scenarios — but also the two that are expected to attract the most jobs and generate the most tax and other revenue. “We’ve made a very tangible recommendation of this as the strategy moving forward that will be best, not just what the public’s told us they want — we had to optimize what the public told us for the best economic outcome for the state,” Chris Conabee, the commission’s other co-chairman, said after the vote. Among specific transportation proposals are a new north-south main road from Bangerter Highway in Draper to 2100 North in Lehi that will relieve traffic bottlenecks through the area on I-15, as well as new east-west roadways and bridges. Plans also call for extending and expanding TRAX and FrontRunner rail service and bus service to the area. As envisioned under that proposal, nearly seven out of 10 households in the area could be within half a mile of transit and FrontRunner daily ridership could quadruple. At the heart of the plan is the mixed-use proposal for the state-owned prison property. 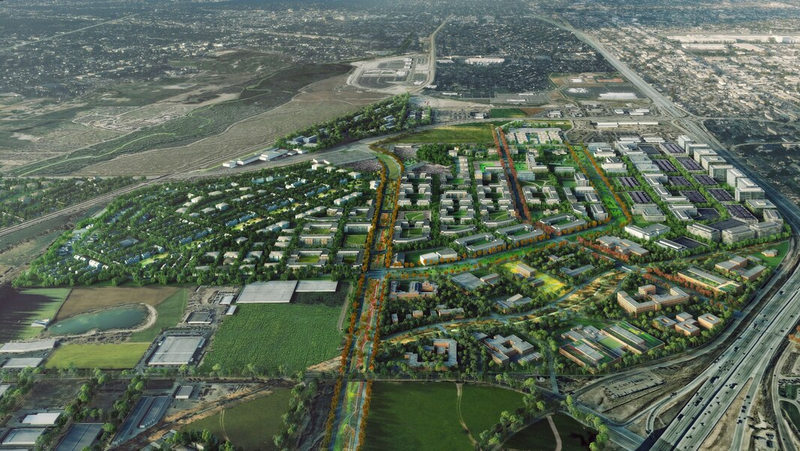 A plan devised by design and planning firm HOK envisions a pedestrian-friendly development divided into districts for residences, offices, retail, a research facility, and light industry. “The prison site is the crown jewel of what happens in that region,” said Robert Grow, CEO of Envision Utah, which developed the plans for the commission. He said the independent authority to oversee how the property is developed would coordinate among the eight cities, two counties and various transportation agencies that overlap the larger 20,000-acre project area.